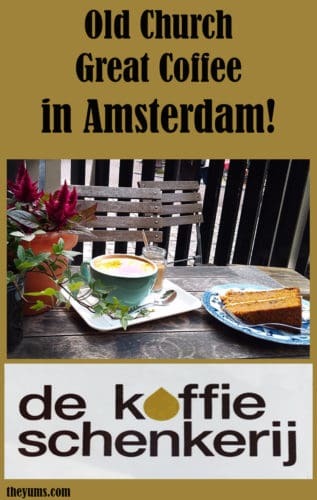 Menu: De Koffieschenkerij is where you come for a cup of coffee or tea, a homemade lemonade, and some of the best cakes and pastries in town. There’s also a light lunch menu, with piled-high triple-decker sandwiches and hearty, flavorful soups of the day. Thoughts: There is no escaping the age that permeates the walls of De Koffieschenkerij. The Oudekerk itself dates from 1306, and the part of the building that houses the café dates to 1515. That 500+ years of history is visible in the décor of the walls, paintings, ceiling, floors of the café. Playing against that, owners Job and Anne have used mid-century-modern furnishings and lighting fixtures to lighten things up and “comfortize” the seating. Surprisingly, this eclectic mix works. Even more so in the cozy upstairs attic, a wonderful getaway when it’s too chilly to enjoy the garden. Up here, under a slanted wood ceiling, you’ll find a sofa, a Persian rug, a vintage record player, comfortable chairs. It feels like you’re relaxing in someone’s living room. Out in the almost-secret garden, roses overflow from lattices on the ancient brick walls marked with tiny so-Dutch red wood shutters. The cobblestone-paved terrace is a pretty little sun trap with wooden tables and French park-style chairs. Raised plantings spill more flowers and greenery. It’s one of the pleasantest spots in a very pleasant city. As for the food and drink, the emphasis is on purchasing organic and locally sourced items made from the freshest high-quality ingredients. The vegetarian soups are feel-good as well as taste-good. They come from a local NGO called “Not For Sale.” Their kitchen, right across the street from the café, provides culinary and professional training for victims of human trafficking, designed to help them re-enter society with a clear future. The appeltaart, a famous Dutch treat that’s a sort of cross between apple cake and American-style apple pie, is made with the same family-owned recipe used by the famous café Winkel, which is often said to have the best in town. Sandwich choices vary by the day, perhaps organic goat cheese or delicately sliced smoked salmon tripled stacked on chewy whole-grain bread. The deep-dish yoghurt/granola bowl is topped with a small mountain of seasonal fresh fruit, perhaps strawberries, blueberries and peaches, kiwi or red currants. But you must leave room for a pastry. The cakes at De Koffieschenkerij are legendary to those in the know. One of the most popular is the carrot cake, dense and not overly sweet, which wins kudos on every review site. Or you might want to try the apple cinnamon loaf, the chocolate fudge cake, peanut chocolate cake, blueberry cheesecake, or any of several other choices. And not to forget that they offer pastel de nata, those wonderful small Portuguese egg tarts in flaky pastry that are addictive. Available drinks at De Koffieschenkerij include all the standard coffee choices, which can be ordered with coconut, nut, or soy milk as well as dairy. Rich hot chocolate delights, and the chai latte is heavenly, some of the best I’ve ever had. The house blended fresh ginger and orange tea is delectable. The home-made lemonade is perfect for sipping in the garden, where you can make friends with the local crow. You place your order inside at the counter, where a glass case displays that day’s pastries. They always include some gluten-free and vegan options. Service is friendly, helpful and efficient. Once you’re seated, you’ll find free wi-fi throughout, although there’s a corner of the café set aside as a “screen-free zone” where Job and Anne encourage “reading, day-dreaming and chit-chatting.” Your order will come on charming, mis-matched vintage dishes which simply add to the atmosphere of coziness and enveloping comfort, that particularly Dutch quality known as gezelligheid. Price Range: Prices run close to normal for Amsterdam cafes. The sandwiches of the day cost €5.50-7.00. Soup of the day with bread is €6.00. Yoghurt with granola and fruit is also €6.00. Cold drinks run €2.70-3.50. Hot drinks are €2.50-3.00. Pastries start at €2.90 for a pastel de nata and go to €4.00 for the appeltaart with a healthy dollop of fresh whipped cream.